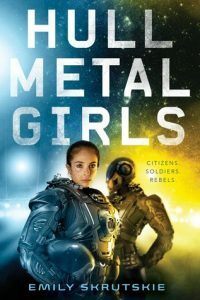 I won a signed copy of Hullmetal Girls , by Emily Skrutskie though Goodreads. This was so much better than I expected. I’m just so jaded on YA lit, but this gave me hope for the genre. These girls face some real challenges and succeed through perseverance and determination, every times. Plus, the book is full of diversity and calmly breaks patriarchal norms all over the place. There are people who look different from one another and economic/class distinctions. There’s an aroace character, a pansexual character, someone who isn’t sure, a heterosexual character (they have a conversation, sexuality isn’t a big thing in the book). A gay couple adopts a child because a woman loves her child but isn’t maternal or want to be a mother and that’s ok. One of the main characters is religious and wears a head scarf. All the people in positions of power are female (even God) and no one tries to explain it away or excuse it. Romance or being slighted by a man isn’t a motivating force for anyone. Of the only significant male characters, one is inept and clumsy and one is a support worker. There is just so much to love about it. I did think the story was dependent on the characters being given leeway that didn’t make sense and I wasn’t entirely sure what actually happened with Key at the end. It didn’t seem to fit the science of the eco rigs, as explained. But these are small complaints on the whole, I really enjoyed the book and look forward to more of Skrutskie’s writing. This entry was posted in books/book review and tagged 5*, book review, feminist, sci-fi, won, YA on April 4, 2018 by Sadie.